Midsize pickup trucks cater to drivers who require the power, capability and versatility of a pickup truck, with a more affordable price tag and more efficient fuel-economy ratings. 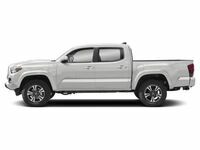 Within the competitive midsize pickup truck segment, the Toyota Tacoma resides at the head of the class as the perfect combination of style, technology, performance, price and toughness. Drivers who find themselves in need of a capable pickup truck that will not break the bank at the dealership or the fuel pump will find the answers they are looking for in this 2018 Toyota Tacoma vs 2018 Nissan Frontier comparison. When you choose the 2018 Toyota Tacoma, you will have a choice of six capable trim levels – SR, SR5, TRD Sport, TRD Off-Road, Limited and the trail-rated TRD Pro – that will start at just $25,200. 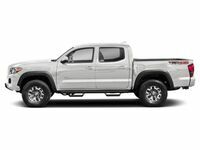 Toyota Tacoma models are available in Access and Double Cab configurations that can be tailored to fit your specifications with a 6.1-foot long bed or a 5-foot short bed. 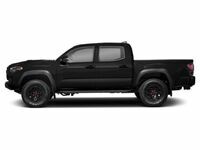 Unrivaled safety is a highlight of the Toyota Tacoma design that starts with standard Toyota Safety Sense™ technology that includes a Pre-Collision System with Pedestrian Detection, Lane Departure Alert with a Sway Warning System, Automatic High Beams, Dynamic Radar Cruise Control and a rearview camera. What Are the Advantages of the 2018 Toyota Tacoma? A world-class midsize pickup truck, the best-selling Toyota Tacoma is an overwhelming favorite in this 2018 Toyota Tacoma vs 2018 Nissan Frontier comparison – and it all starts under the hood. Toyota Tacoma pickup trucks provide drivers with two powertrain options – a standard 159-horsepower 2.7-liter four-cylinder engine and a fan favorite 278-horsepower 3.5-liter V-6 power core. Married to a six-speed automatic transmission, the 3.5-liter Toyota Tacoma will tow an impressive 6,800 pounds and still earn 19 mpg in the city and 24 mpg on the highway. A 1,620-pound maximum payload is an added advantage that the Toyota Tacoma possesses in this debate. When it comes to power, capability and fuel economy, the Nissan Frontier cannot match what the Toyota Tacoma brings to the table. Entry-level Nissan Frontier editions feature a 152-horsepower 2.5-liter four-cylinder engine that will achieve 19 mpg in the city and 23 mpg on the highway with the five-speed manual transmission. An upgrade to the 261-horsepower 4.0-liter V-6 will upgrade power yet falls short in terms of fuel economy, achieving 16 mpg in the city and 22 mpg on the highway with a five-speed automatic transmission. When properly equipped, the Nissan Frontier will tow 6,710 pounds of cargo and will haul 1,430 pounds of gear. The Toyota Tacoma advantages continue when you slide into the driver's seat at Downeast Toyota. All Toyota Tacoma trim levels feature a standard Toyota Entune™ infotainment system that will include Bluetooth and a 6.1-inch touchscreen display in base formats. Toyota Entune™ upgrades include Integrated Navigation, Toyota Entune™ App Suite, a 7-inch touchscreen display, a premium JBL Audio system and more. Nissan Frontier models incorporate a standard 5-inch display that can be upgraded to a 5.6-inch NissanConnect touchscreen interface with navigation at additional cost. Visit Downeast Toyota today to experience the advantages of the 2018 Toyota Tacoma firsthand!